The more researchers learn about developmental disorders, the more they learn how complex they truly are. While scientists now know that these conditions have more than one cause, pinning down how and why they happen has so far eluded them. But Laura Lee McIntyre in the UO College of Education says further advances might soon be closer at hand. McIntyre, an expert in children’s and teens’ mental health issues, will discuss her research and the future of her field at a free lecture at 7 p.m. Tuesday, Nov. 14, at the John G. Shedd Institute for the Arts, as part of Science Knight Out, a series hosted by the Phil and Penny Knight Campus for Accelerating Scientific Impact. Her talk is titled “A Spectrum of Promise: A Multidisciplinary Approach to Autism and Other Neurodevelopmental Disorders.” To reserve free tickets, visit uoregon.edu/scienceknight. 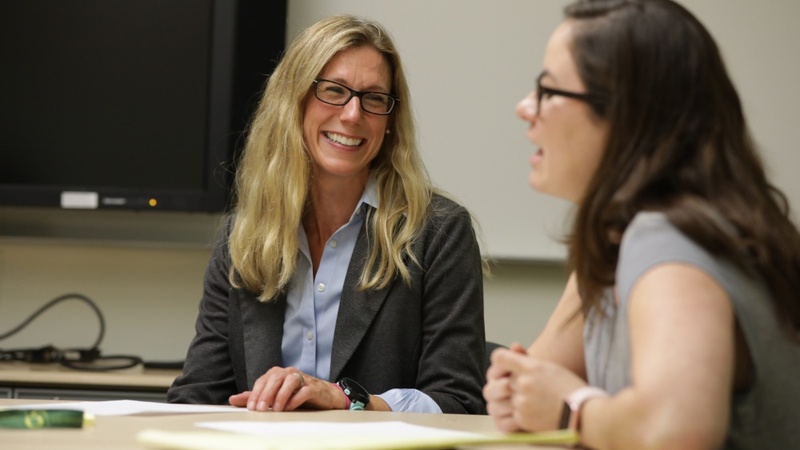 McIntyre, associate director of the UO Child and Family Center at the Prevention Science Institute, explores conditions such as attention deficit hyperactivity disorder, obesity and autism. She develops early childhood treatment and education strategies while also looking at how to help families better handle the challenges the disorders bring. McIntyre is known around the country for tapping colleagues from across multiple disciplines for their expertise on how to attack these complicated problems. And that just might be the key to uncovering a cure. McIntyre’s work is an exemplar of collaborative research. And collaborative and innovative research is exactly what the Phil and Penny Knight Campus for Accelerating Scientific Impact is intended to elevate. The $1 billion facility will combine researchers from multiple disciplines in a single, state-of-the-art facility, where they can speed progress toward breakthroughs. McIntyre said that by purposely creating interactions between experts in fields that don’t typically interact, as will happen at the Knight Campus, synergies take place. McIntyre points to her collaboration with Fred Sabb of the UO’s Lewis Center for Neuroimaging. The duo has been looking at ways to more quickly detect disorders in children at a younger age by pulling from each researcher’s area of expertise. Autism alone is estimated to affect 1 in 68 children, and despite gains, detection remains an inexact science. Early detection is critical to developing strategies that can minimize the effect such disorders have on children, as well as on their families and caregivers.